IN A RECENT ARTICLE FOR THE U.S. Army’s Military Review, Amitai Etzioni, a well known public intellectual and a professor of international affairs at George Washington University, argues that the United States will have to bomb Iran to prevent that country from acquiring nuclear weapons. Offering at times banal arguments about how the United States must demonstrate it is a real global power, Etzioni has added his voice to an increasingly raucous chorus of right-wingers and militant “pro-Israel” groups who warn that Tehran must be prevented from acquiring nuclear weapons at all costs. Etzioni’s status as a renowned scholar of social policy whose work has won praise both nationally and internationally warrants paying close attention to the potential impact of his utterances on U.S. foreign policy discourse. Additionally, his increasingly strident stance vis-à-vis purported threats to the United States and Israel comes at a time of growing polarization in the United States over whether the country—and, in particular, its Jewish community—should support the hardline policies pursued by Israel’s leaders. How is it that Etzioni—a self-described “peacemonger” who was once dubbed “the Everything Expert” by Time magazine —has come to adopt stridently hardline prescriptions for U.S. foreign policy? And are his arguments on Iran valid? Over the past half century, Etzioni has authored two dozen books, some 600 articles in newspapers and magazines, and well over 300 scholarly papers. 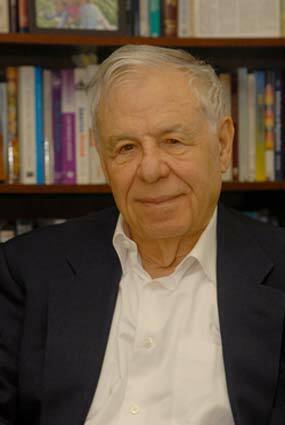 In 2001, Etzioni was included on a list of the top 100 U.S. intellectuals, measured by sheer number of academic citations. A professor at George Washington University since 1980, Etzioni also taught at Columbia University for twenty years, was a guest scholar at the Brookings Institution, and served as an adviser to President Jimmy Carter. Now an octogenarian, Etzioni has adapted to the Internet-Facebook-Twitter age, blogging regularly on his own website and nurturing an echo chamber for his views by cross-posting his commentary on a number of websites that span the political spectrum, including the Huffington Post, Politico’s Arena, Talking Points Memo, Global Security, and PoliticalMavens.com (a right-wing site that also hosts the likes of Steve Emerson, Michelle Malkin, Frank Gaffney, Bill O’Reilly, and Thomas Sowell). The “Everything Expert” is now the everywhere expert. Initially, Etzioni’s communitarian policy prescriptions were almost entirely limited to the domestic sphere. “The essence of the communitarian position is that strong rights entail strong responsibilities,” Etzioni wrote in a recap of the first year of the movement, elaborating a “Communitarian Platform” that called for everything from strengthening families by making marriage and divorce more difficult, to reforming welfare and expanding the kind of evidence that can be used to prosecute suspected criminals. In 2004, Etzioni published From Empire to Community: a New Approach to International Relations, in which he claimed to offer an alternative to “might makes right” neoconservatism and what he called “hyper-liberalism,” which relies heavily on international laws and institutions. A sort of kick-in-the-pants version of communitarianism, From Empire to Community aimed to describe a “new global architecture" that would rely less on force and more on shared values. Three years later, in his book Security First: For a Muscular, Moral Foreign Policy, Etzioni revealed a more aggressive attitude toward international relations with his notion of “muscular” morality. He argued that enforcing global security, rather than the promotion of democracy, ought to be the basis of U.S. foreign alliances and interventions. Echoing the early hard-nosed realism of some first generation neoconservatives like Irving Kristol, Security First proposed cooperation with “illiberal” regimes willing to renounce violence, even if they reject democratic values. While insisting that the “golden rule” continues to provide the core of his communitarian vision, Etzioni’s views on foreign policy have become increasingly strident. This past January, for example, he faulted President Barack Obama for adopting “kumbaya communitarianism” when the times call for a “muscular” variety that “can twist the arms of, even give a kick in the pants to, those who refuse to collaborate.” Topping Etzioni’s list of candidates for a good pant-kicking is Iran. Although he asserted in Security First that Russia and Pakistan represent the greatest threats to global security—because of their alleged inability to adequately protect their nuclear materials—Etzioni has in recent years gradually turned up his rhetorical attacks on Iran. The more recent focus of his attention has been challenging the efficacy of deterrence. In his article for Military Review, Etzioni argues that in pursing the dictates of “muscular morality,” the United States and its allies must prevent Iran from acquiring nuclear weapons because deterrence will not work in this case. At the heart of Etzioni’s argument against deterrence vis-à-vis Iran is his notion of “nonrationality.” In Military Review he avers that “the champions of deterrence” erroneously regard states as either “rational” or ”irrational.” Since only a “rational” state—one that would choose to act in accordance with its own best interests—can be successfully deterred, those policy-makers who believe deterrence to be a viable option for dealing with Iran must also believe that Iran’s leaders are “rational,” rather than “irrational,” since they have proven themselves willing and able to act in their self-interest. Ironically, in support of his nonrationality thesis, Etzioni cites the example of Israel. While Israelis are rarely considered to be irrational, they nonetheless “have a strong Masada complex, which led their forefathers to kill each other and commit suicide, rather than surrender.” According to Etzioni, Israel’s Masada complex, which refers to the decision by first century Jewish rebels to kill each other instead of being taken prisoner by Roman soldiers, is echoed in other biblical stories like that of Samson who, in the biblical Book of Judges, brought down the Philistine stronghold in which he was imprisoned, killing himself along with his captors. Etzioni asserts that today’s Israelis also model themselves on the small minority of Jews in the Warsaw Ghetto, who fought to the death against the Nazis, although there was no chance they would emerge the victors. Such deeply held beliefs, says Etzioni, might lead Israel to attack Iran even when rational considerations indicate that such an attack would be extremely detrimental. Such an attack would serve their beliefs and is rational in this technical sense—but the beliefs are based on nonrational commitments that one cannot argue with on the basis of facts and logic, and thus cannot be reliably deterred. One might expect Etzioni to follow up on his comparison of “nonrational” Israelis and Iranians by discussing the dangers posed by Israel’s possession of nuclear weapons. “I’m not in favor of anyone having nuclear weapons,” Etzioni replied when asked about this in a phone interview with this writer. “I’d like the Middle East to be completely free of weapons of mass destruction.” However, while ideally he would prefer to see Israel safe and secure to the point that it would not require a nuclear arsenal to ward off attack, Etzioni appears to view the Israeli arsenal as reasonable given its circumstances. At the heart of Etzioni’s plan to prevent Iran from acquiring nuclear weapons is a broad U.S. bombing campaign targeting Iran’s civilian infrastructure, including “bridges, railroad stations, and other such assets, just the way the U.S. did in Germany and Japan in World War II.” A concerted attack of this kind would, he argues, be the only way to dissuade Iran from attempting to develop nuclear weapons. Yet American Jewish leaders have—until now—been reluctant to call for outright war against Iran. The perception that “if Washington initiates war with Iran over the nuclear issue, it will be primarily in response to pressure from Israel and the more Likudnik parts of the pro-Israel community in the United States” —is deeply troubling to most American Jews. If leaders of Jewish organizations become proponents of a U.S. military strike on Iran, it becomes increasingly difficult to dismiss such perceptions as inaccurate or unfair. Etzioni’s warmongering also comes at a time when the U.S. military is rethinking the premises that drew it into Afghanistan and Iraq, even as increasingly shrill voices on the right are working to push the public to support an “inevitable” attack on Iran. Beeman suspects that “people like Etzioni are hoping to goad Iran into defensive military action to allow Israel to then really launch a full-scale attack.” Etzioni’s insistence that the United States treat an attack on Israel as an attack on its own territory supports this interpretation. That Etzioni would interpret the publication of his article as an endorsement of his personal views and publicize it as such—as he did in his recent interview with Haaretz —is troubling. That Military Review apparently finds Etzioni’s Iran insights to be “well-researched” and “persuasive” is alarming. The possibility that U.S. military strategists might regard them as plausible is downright scary. Dr. Marsha B. Cohen is a Middle East analyst and a contributor to IPS Right Web (https://rightweb.irc-online.org/) who specializes in Iranian-Israeli relations and U.S. foreign policy. Amitai Etzioni, “Can a Nuclear-Armed Iran Be Deterred?” Military Review, May-June 2010, http://usacac.army.mil/CAC2/MilitaryReview/Archives/English/MilitaryReview_20100630_art016.pdf. See, for example, Daniel Luban, “The Changing Face of American Zionism,” Inter Press Service, “Lobelog,” May 17, 2010, http://www.lobelog.com/the-changing-face-of-american-zionism/. Amitai Etzioni, "A 'Peacemonger' Answers Some Questions" The New York Times Magazine, April 21, 1963. Amitai Etzioni, “The Communitarian Platform.” The New Democrat, July 1992, pp. 23-25. Amitai Etzioni, My Brother’s Keeper: A Memoir and a Message. Rowman and Littlefield, 2003, p. 308. Amitai Etzioni, “Debunking Israel.” Weekly Standard, Jan. 17, 2000, pp. 33-35. Amitai Etzioni, “A Fence to Make Good Neighbors.” Christian Science Monitor, Aug. 6, 2003. Amitai Etzioni, Security First: For A Muscular, Moral Foreign Policy.Yale University, 2007. Amitai Etzioni, “On Deterring Iran.” Huffington Post, May 29, 2008. Amitai Etzioni, “Can a Nuclear-Armed Iran Be Deterred?” Military Review, May-June 2010, http://usacac.army.mil/CAC2/MilitaryReview/Archives/English/MilitaryReview_20100630_art016.pdf, p.124. Amitai Etzioni, “Can a Nuclear-Armed Iran Be Deterred?” Military Review, May-June 2010, http://usacac.army.mil/CAC2/MilitaryReview/Archives/English/MilitaryReview_20100630_art016.pdf, p.125. James Besser, “Jews Brace For Next Phase In Iran Battle,” Jewish Week, June 23, 2010, http://www.thejewishweek.com/news/national/jews_brace_next_phase_iran_battle.